That the internet has radically transformed how we market, promote, and build our businesses is a given. Looking at marketing communications and marketing strategy, the two big differences for businesses between today and say just some five years ago is having access to the many digital resources available and the use of online marketing tools. 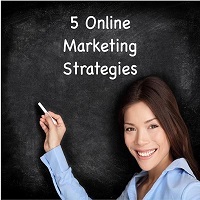 Whether you are a newbie or a start-up entering the world of business or an experienced marketer, there is no need to be intimidated by the sheer number of online marketing strategies out there. If you haven’t already done so, it’s time to embrace the e-revolution and use it to your advantage. what a marketing services provider doing SEO for a client is to make sure that a search engine’s algorithm can understand quickly what are your business services and products are. As an Internet marketing strategy, SEO considers how search engines work, the computer programmed algorithms which dictate search engine behavior, what people search for, the actual search terms or keywords typed into search engines, and which search engines are preferred by their targeted audience. Optimizing a website may involve editing its content, adding content, doing HTML, and associated coding to both increase its relevance to specific keywords and to remove barriers to the indexing activities of search engines. Promoting a site to increase the number of backlinks, or inbound links, is another SEO tactic. Search engine optimization not only helps you present your website appropriately for search engines to receive a higher rank in search results, but also creates a more exceptional user experience for your potential customers and visitors. The content marketing is a fundamental aspect of every good online marketing strategy. Though its purpose is not to openly promote a brand, it ultimately stimulates the interest of your targeted audience in your businesses. Content marketing is incredibly versatile, and it takes a variety of forms such as the use of white papers, on-site bogs, signups, and conversion to drive more organic traffic to your site. Again, Wikipedia explains this further: Content marketing means attracting and transforming prospects into customers by creating and sharing valuable free content. The purpose of content marketing is to help companies create sustainable brand loyalty and provide valuable information to consumers, as well as create willingness to purchase products from the company in the future. This relatively new form of marketing usually does not involve direct sales. Instead, it builds trust and rapport with the audience. Social media marketing covers the use of social media platforms (e.g., Facebook) and websites (e.g., isoosi.org) to promote a marketer’s product or service. Social media marketing provides you greater brand visibility, better inbound traffic, and helps you build your brand image. It’s a powerful way for businesses of all sizes to directly interact with their audience and customers and attract new customers daily. Effective marketing on social media can bring significant success to your business, drive leads and sale, and create devoted brand advocates. With social media marketing, marketers communicate to their audience using their customers or clients, employees (both current and former), as well as journalists or writers, bloggers, and the general public. [Email marketing]…usually involves using email to send advertisements, request business, or solicit sales or donations, and is meant to build loyalty, trust, or brand awareness. Marketing emails can be sent to a purchased lead list or a current customer database. The term usually refers to sending email messages with the purpose of enhancing a merchant’s relationship with current or previous customers, encouraging customer loyalty and repeat business, acquiring new customers or convincing current customers to purchase something immediately, and sharing third-party ads. With a properly designed email marketing campaign, you have the opportunity to offer something unique to your customers. You should ensure that you keep the campaign relevant, offer something unique, and send a strong message that captures attention. While most of the online marketing strategies aim to get more people on your website, conversion optimization ensures that you get more value out of every visitor by helping to increase the rate of conversion. It offers more conversion opportunities and also helps to improve the ones you have already. Conversion optimization, or conversion rate optimization (CRO) focuses on increasing the percentage of visitors to a website that converts into customers, or takes a desired action on a webpage. This is commonly referred to as CRO. Conversion rate optimization shares many principles with direct response marketing – a marketing approach that emphasizes tracking, testing, and on-going improvement. Finally, we note that to have a successful online marketing strategy, you need to work on all your options and pursue them individually to seek a higher potential return. The five options given here are by no means the only one but in our opinion are the more important ones. They’re certainly ones that you cannot ignore. To help you get your marketing communication message out there and get the best results, it is always best to consult a knowledgeable person or firm. Feel free to contact us at JG Marketing Services.